Halemaumau Crater isn’t the only thing making noise in Volcano these days. 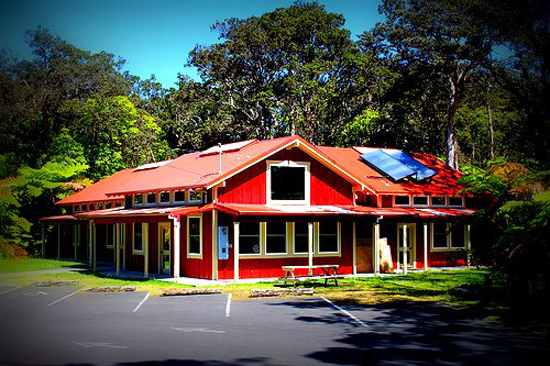 Volcano Art Center, well known for its popular gallery inside Hawaii Volcanoes National Park since 1974, announces the official grand opening of a second gallery location in Volcano Village. Please join the VAC staff, board and volunteers in celebration of the new Rainforest Gallery at Niaulani at 6:30 p.m. Thursday, Oct. 25. “Brushed by the Heavens and Inspired by Nature,” the Rainforest Gallery grand opening festivities will include live music, desserts, surprise giveaways and a final glimpse at the current installment – a group exhibition entitled The Elemental: Setting Forth Various Elements Through Transfigurement Into Shining. The Rainforest Gallery at Niaulani is now open daily from 9am to 4pm (closed Sundays and holidays) and features a small café serving specialty coffee, espresso, tea and treats. Immediately preceding the gallery opening will be VAC’s Annual Membership Meeting, the yearly gathering of members to formally elect new candidates for the Board of Directors. The nominated slate of incoming board members includes: Donna Barr, Darla Deville, Robert N. Herkes, Vicki Penney-Rohner and Britten Traughber. Presided by Board Chair Linda Pratt and Chief Executive Officer Tanya Aynessazian, members in attendance will hear about noteworthy past events and future plans, which are directly impacted by their support. A special award for “VAC Gallery Artist of the Year” will also be announced based on member selection. Member check-in begins at 5 p.m. and a light supper will be provided before the meeting is called to order at 5:30 p;m. For members who are unable to attend in person, proxy ballots must be received by 5 p.m. Oct. 23 and addressed to: Volcano Art Center, PO Box 129, Volcano, HI 96785. Both events will take place at VAC’s Niaulani Campus located at 19-4074 Old Volcano Road in Volcano Village. For more information, contact Tanya Aynessazian at 967-8222 or info@volcanoartcenter.org.